American Literatures Initiative, 9780823274550, 320pp. In this profoundly innovative book, Ashon T. Crawley engages a wide range of critical paradigms from black studies, queer theory, and sound studies to theology, continental philosophy, and performance studies to theorize the ways in which alternative or "otherwise" modes of existence can serve as disruptions against the marginalization of and violence against minoritarian lifeworlds and possibilities for flourishing. 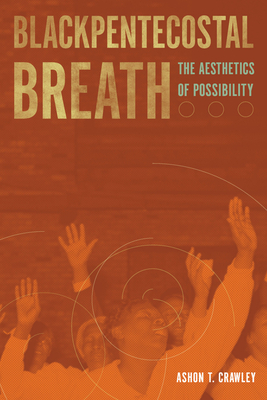 Examining the whooping, shouting, noise-making, and speaking in tongues of Black Pentecostalism--a multi-racial, multi-class, multi-national Christian sect with one strand of its modern genesis in 1906 Los Angeles--Blackpentecostal Breath reveals how these aesthetic practices allow for the emergence of alternative modes of social organization. As Crawley deftly reveals, these choreographic, sonic, and visual practices and the sensual experiences they create are not only important for imagining what Crawley identifies as "otherwise worlds of possibility," they also yield a general hermeneutics, a methodology for reading culture in an era when such expressions are increasingly under siege. Ashon T. Crawley is Assistant Professor of Ethnic Studies at University of California, Riverside.